Saul Junction is where the Gloucester & Sharpness Canal crosses the line of the earlier Stroudwater Canal, the only crossing of two independently owned canals in the country. The Stroudwater Canal, opened in 1779, allowed barges to carry coal to the cloth mills of the Stroud Valley. The Thames & Severn Canal, opened in 1789, continued the line to Lechlade on the River Thames, and so provided a through route to London. To form the Junction, the level of the Stroudwater Canal had to be raised about four feet locally to suit the level of the Gloucester Canal, and this required the construction of a new lock. 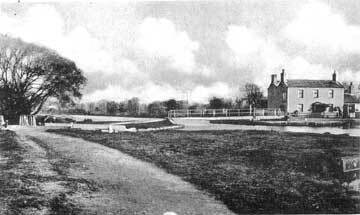 A house was built at the Junction for the official who collected tolls from vessels passing from one canal to the other and who opened the foot-bridge over the Gloucester Canal. This current view shows the lock (now derelict) on the left and a more modern footbridge over the Gloucester & Sharpness Canal. The willow tree left of centre was planted in 1993 when the Willow Trust established their base here. After a slow decline, traffic on the Stroudwater Canal ceased in 1941, and much of the route became derelict, but the section to the south-east of Saul Junction continued to be maintained, as it served as a feeder bringing water from the River Frome into the Gloucester & Sharpness Canal. For an account of how the water supply was estblished in the 1830s, see the Battle of Whitminster Weir. The length up to Walk Bridge now provides moorings that are administered by the Saul Junction Boat Owners Club. 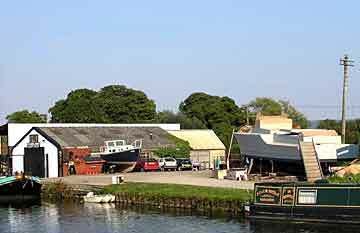 Volunteers of the Cotswold Canals Trust have established a Heritage Centre at Saul Junction, which is open on Saturday and Sunday afternoons throughout the year and on Sunday mornings from April to October. Trust members have long campaigned for the restoration of the Stroudwater and Thames & Severn Canals, and the Centre aims to inform visitors about the history of the link to the Thames and the prospects for re-establishing it. 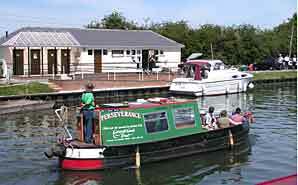 The Trust volunteers also welcome the public on their boat Perseverance, shown right passing the Heritage Centre, on weekends during the summer. The Willow Trust is a charity operating passenger boats from Saul Junction which are specially designed to cater for groups of infirm and disabled people who do not have to pay anything as all costs are covered by donations. The white building immediately north of Saul Junction is the Wycliffe Sculling Centre housing the boats used by the boys of Wycliffe College, Stonehouse. In the 19th century, this site was a centre for building and repairing barges and small sailing vessels, and the shed was the base for the Canal Company craftsmen who made and maintained the wooden canal bridges and the lock and dock gates. Now R W Davis & Son occupy the whole site, including the shed which replaced the old one following a fire. 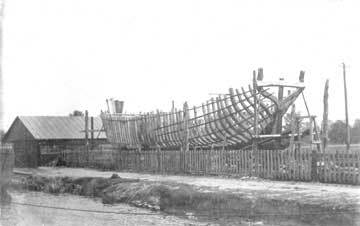 The work is now all concerned with building and repairing pleasure craft. Note the surviving pole for the former overhead telephone lines. 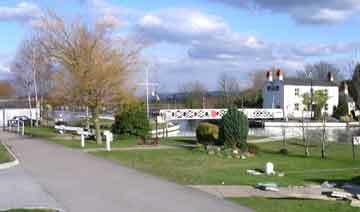 A 284-berth marina to the south of Saul Junction was opened in 2008. For more details, see how the site was developed and how it operates. A keen group of local people are collecting tales of village life, family history and photographs about the places linked by the waterways which meet at the Junction. For more details, see the Project website.